How fitting that IMA IMA, violinist Meg Okura’s wonderful fourth album with her Pan Asian Chamber Jazz Ensemble, should be released on Mother’s Day. After all, ‘Ima’ means ‘mom’ in Hebrew (Okura converted to Judaism four years ago) and ‘now’ in Japanese, and the album celebrates woman- and motherhood in honouring four generations of women, from her late grandmother to her seven-year-old daughter. Issued concurrently with the ensemble release is the debut album from NPO Trio, Live at The Stone, featuring Okura, soprano saxophonist Sam Newsome, and pianist Jean-Michel Pilc in a live set recorded at John Zorn’s East Village club. 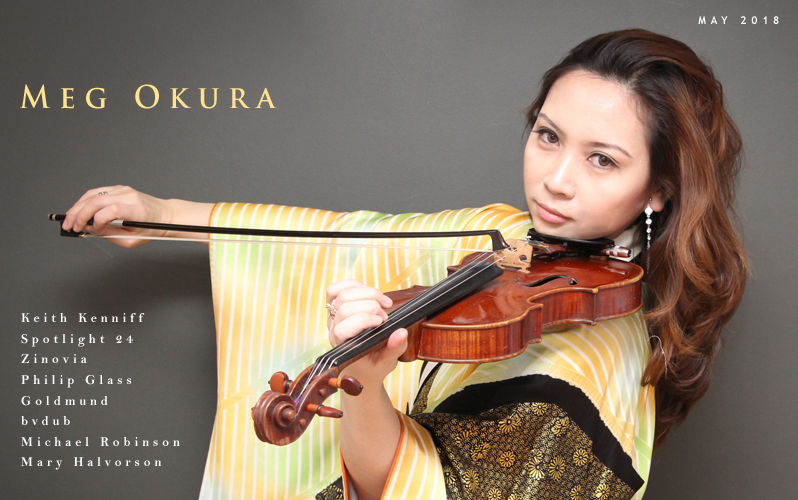 Okura, by the way, is a seasoned pro, a one-time concert violinist and Julliard School graduate who’s performed and recorded with Herbie Hancock, Shirley Horn, Diana Krall, David Bowie, Lee Konitz, and Diane Reeves, among others. She’s toured with Michael Brecker, Steve Swallow, and Tom Harrell, and in 2016 conducted a week-long residency at the Stone that saw her presenting twelve concerts with ten different groups, NPO Trio included. Of the two recordings, it’s IMA IMA that makes the strongest impression. Though the album’s a studio date, it exudes the energy and effervescence of a live performance; furthermore, all seven of Okura’s settings were laid down on a single December day in 2015, suggesting that the participants came to the session with a number of run-throughs under their collective belt. With trumpeter/flugelhornist Tom Harrell and guitarist Rez Abbasi joining Okura (violin, erhu, vocals), Newsome (soprano sax), Sam Sadigursky (clarinets), Anne Drummond (flutes, piccolo), Brian Marsella (pianos), Riza Printup (harp), Pablo Aslan (bass), and Jared Schonig (drums), the group number totals ten yet never sounds unwieldy. If anything, the outfit executes Okura’s challenging charts with assurance and produces a vibrant orchestral sound despite its modest (by orchestra standards) size. The name’s a mouthful, but The Pan Asian Chamber Jazz Ensemble turns out to accurately convey the multiple hues of the band’s ravishing East-meets-West fusion. On this action-packed collection, Drummond, Newsome, Printup and Marsella introduce the title track with evocative flourishes before the full ensemble emerges, its sound blossoming as Okura elevates the sound with her sweetly singing violin. Harp strums and violin flourishes then establish a dream-like character in “A Summer in Jerusalem” until Sadigursky’s bass clarinet voices the tune’s rhythm motif and the others follow suit with sinuous, mystery-laden themes. Electric piano brings a jazzy spin to the performance, after which Harrell and Abbasi contribute mellifluous solos as the music swells rapturously, buoyed by a soul-stirring turn by the leader. Conceived as a romantic story about two young people (a Jew and Arab) who fall in love against a tumultuous Israel backdrop, the exhilarating ten minutes of “A Summer in Jerusalem” certainly constitute an album high point if not its peak. The rhythmically propulsive “A Night Insomnia” follows, its advance jumpstarted by a funky rhythmic motif and its smooth flow occasionally interrupted by rapid metric modulations, perhaps a few too many. Regardless, strong moments by Harrell and Drummond and luscious ensemble playing more than compensate for any unease engendered by the tempo shifts. As structurally ambitious is “Birth of Shakyamuni,” a piece inspired by the birth of Buddha, who was conceived when a white elephant touched his mother’s side. Oscillating between ponderous, rapid-fire, and even klezmer-tinged passages, the setting ventures through multiple parts without pause, each designed to capture the mood of the story section in question. Elsewhere, Okura frames “Black Rain” with erhu playing, its timbres, along with those of the harp and woodwinds, helping to conjure the atmosphere of war-torn Japan in the wake of atomic bomb devastation, and eventually caps the piece with an emotionally expressive violin solo. Rare on a recording where solos are concise and the ensemble playing hews closely to the writing, “Blues In Jade” achieves liftoff when Marsella, powered by a stoked Schonig, embarks on an extended solo. Comfortably transitioning between composed and solo sequences throughout the fifty-eight-minute set, the musicians navigate the intricate pathways of the leader’s writing with seeming ease, and woodwinds, strings, harp, and percussion work together to create the impression of an ensemble considerably larger than a tenet. As mentioned, the NPO Trio release stems from Okura’s week-long residency at The Stone in April of 2016. The live recording sees the violinist joining Newsome and Pilc following the 2017 release of the latter pair’s Magic Circle. To a far greater degree than IMA IMA, Live at The Stone is rooted in improv, though melodies derived from Yiddish songs and Coltrane’s “Giant Steps” are invoked by the trio. Structurally, the album splits into three improvisational parts, the first the longest at thirty-eight minutes and divided into six sub-sections for the purpose of the album presentation; the short second references the Coltrane tune, while the nineteen-minute third uses two melodies derived from Jewish and Japanese cultures as a foundation. The melody that repeatedly surfaces during the six-part improv comes from “Oyfn Pripetchik,” a Yiddish song by Mark Warshawsky (1848–1907); its manner of arising proves effective, with the mournful theme not always explicitly voiced (as happens during Newsome’s impassioned turn on “Pleading”) but instead alluded to via sidelong glances. “Giant Steps” is likewise referenced subtly, in this case overt citations of its melody reserved for the second half of “Unkind Gestures”; in the explorative minutes leading up to that moment, Pilc accompanies Newsome’s high-pitched squeals with strums of the piano’s strings and indulges in conversational to-and-fro with Okura. She initiates the final piece, “Yiddish Mama No Tsuki,” with a furious cadenza based on the songs “My Yiddish Mama” and “Kojo No Tsuki” before an Argentinean tango feel threads its way into the ultimately swinging presentation. It’s not uncommon for an artist to generously cede the spotlight to guests during a residency, but in this case Newsome and Pilc dominate, so much it feels as if Okura’s been relegated to the background. The joyously singing violin that makes IMA IMA such a treat figures less prominently on the live set, Okura often accompanying her partners with plucking rather than bowing, and one comes away from the recording wishing she had been more equitably accounted for. When she does step forward, as happens during the opening improv’s dramatic “Oyfn Pripetchik-ish” and lyrical “Travels” sections, the music’s elevated by the expressiveness of her playing. Don’t get me wrong: the performances by the saxophonist and pianist are compelling and committed, but a better three-way balance would have made for a more satisfying presentation; if anything, Okura here seems more guest than host. The reservations about the live set notwithstanding, the releases show her to be a major force as a composer, arranger, musician, and bandleader, even if it’s IMA IMA that makes the greater impression. ← OUT TODAY! Don Braden Releases “Earth Wind and Wonder” on Creative Perspective Music!